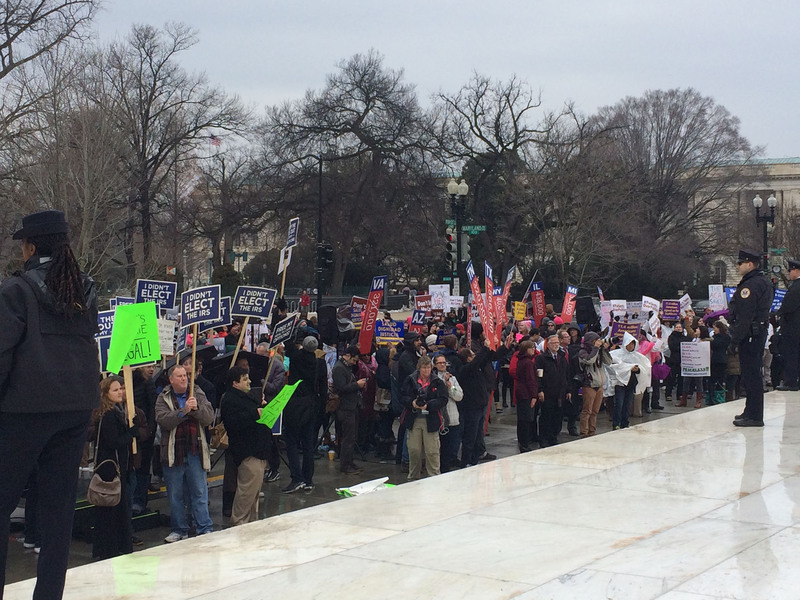 WASHINGTON – Dozens of protesters came on an overcast Washington morning Wednesday to make a noisy statement about King v. Burwell, the latest challenge to Obamacare that was being argued inside the court. 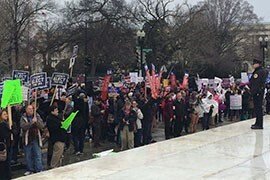 They represented both sides of the debate – a group of Obamacare supporters in bright-pink knit hats on one side of the court steps and a smaller contingent waving a “Don’t Tread on Me” flag on the other. They preached and chanted and played pop music through loudspeakers, not really engaging but trying to shout over each other. At issue is a legal challenge to the federal subsidies that aim to help low- and middle-income individuals pay for health care under the Affordable Care Act, better known as Obamacare. Opponents claim that the IRS has improperly extended the tax credits to individuals in states – like Arizona – that did not set up their own marketplaces for health care but relied on the federal marketplace. But supporters say that losing those credits could be “devastating” to the health care law. Karen Davenport of the National Women’s Law Center is one of those who worries about the impact the court’s ruling could have, particularly if low-income women who got insurance under the Affordable Care Act lost the benefit of those tax credits. “If the case goes the wrong way they can lose the ability to get that kind of help,” said Davenport, whose organization was one of many submitting briefs in support of the government. 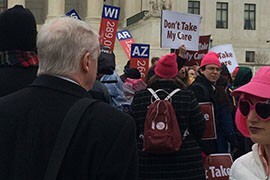 Protesters held large signs showing how many residents could lose coverage if the case overturned their subsidies in each of the 34 affected states. 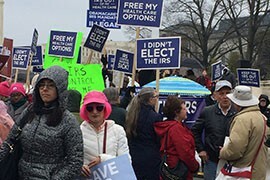 Opponents had their own signs that said things like “Keep the IRS out of my health care” and “I didn’t elect the IRS.” They started out with a handful of signs, with more being added slowly as the case went on inside the courtroom. One man waving a “Don’t Tread on Me” flag walked up and down the area, alternating chants every couple minutes through a megaphone. From a podium on the Supreme Court plaza, another opponent asked the crowd if “anyone with a functioning brain” thought that healthcare.gov or the former Health and Human Services Secretary Kathleen Sebelius is an exchange set up by the state – the mechanism the law says can offer subsidies. As he spoke, Taylor Swift’s “Shake It Off” started playing over his voice from the other side of the protest. 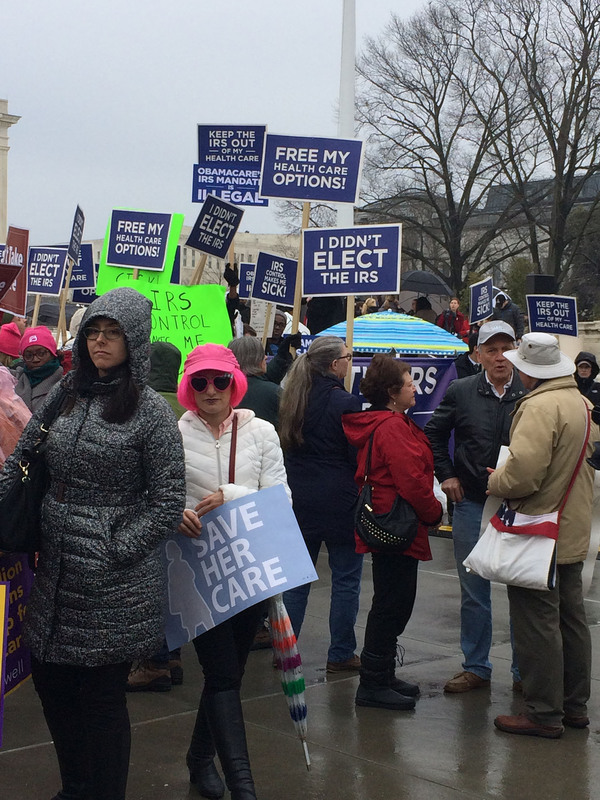 As the dark skies turned to drizzle, Obamacare supporters used loud music and inspirational preachers to liven the morale of the crowd and to cancel out those speaking on the other side of the protest. Medical professionals, special-interest groups and regular citizens who could be affected by the outcome of the case were all on hand, some of them coming from across the country to protest. Adrienne McLean, a medical assistant from Indianapolis who was protesting with Planned Parenthood, said she got health care under the federal marketplace and that without the subsidies she might not be able to afford the insurance. Kyle Ragins, a fourth-year Yale medical student who there protesting with Doctors of America, spoke of a patient who came in with a hand injured in a fistfight. Because he did not have health insurance, the man had waited to get care. His hand became so infected while waiting that most of it had to be amputated, Ragins said. 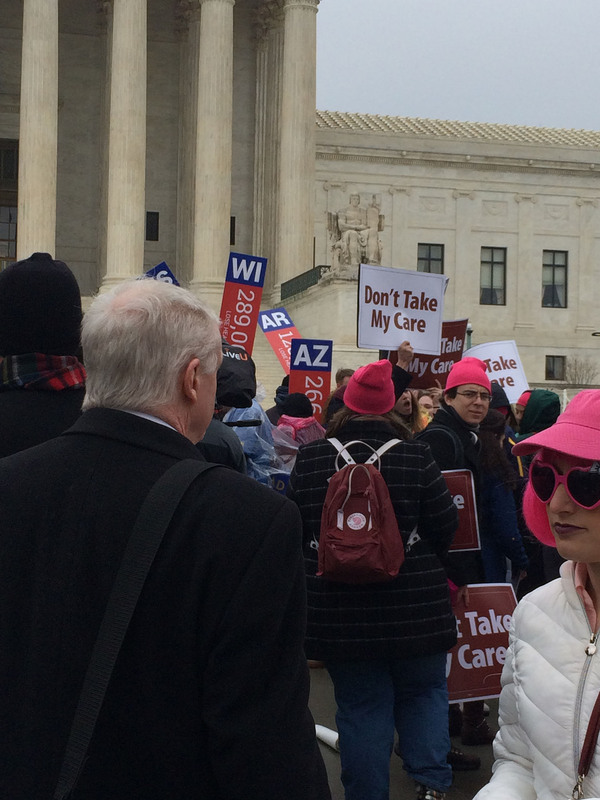 Protesters on both sides of the issue gathered outside the Supreme Court as it considered the latest challenge to Obamacare, King v. Burwell. Supporters of Obamacare said that if the Supreme Court rules against federal subsidies that help pay for their health insurance it could have a "devastating" effect on the health care law. Opponents of Obamacare health-care subsidies say the law says that tax credits can only be offered through state marketplaces. Arizona is one of 34 states that relies on a federal, not state, exchange.